Fall has just begun in New York City. While residents are trading tank tops for sweaters and iced coffees for hot mochas, excitement builds for a surging New York Mets team and the hope for their first World Series berth in 15 years. The leaves are changing as Halloween sets to give doorbells across the state a good workout next weekend. Before long, the holiday season will quickly envelop the city. From Harlem to Chelsea, there’s a little bit of everything for even the biggest Scrooge in town during the Yuletide season. Sure, nobody likes the slush that haunts the city streets after a harsh snowstorm, but who could resist a romantic ice skating session or finding the missing piece to your wardrobe in the heart of Manhattan? Widely considered the No. 1 holiday production in the world and attended by more than one million concertgoers annually, the Radio City Christmas Spectacular at Radio City Music Hall is a surefire way to dive headfirst into the holiday spirit. The Rockettes have commandeered the stage in Manhattan each year since 1933, and their renowned performance only grows bigger with each flip of the calendar. Alongside long-tenured ballads of “Living Nativity” and “Parade of the Wooden Soldiers” are also the stunning GPS-infused finale “Snow” and a 3D ride on Santa’s sleigh. To add the cherry on top, Radio City Christmas Spectacular tickets on TicketNetwork.com are going for below face value for many of the 200+ shows performed this season. Head across the street and experience the sights and sounds of Rockefeller Center after being blown away at Radio City. Located at 45 Rockefeller Plaza, the famous grounds are home to the Rockefeller Center Christmas Tree as well as an ice skating rink directly below. Though the rink is especially crowded during the weekends, a daytime lap during the week could be a jolly alternative. The Rockefeller Center Christmas Tree Lighting will be held December 2 at 7 p.m. Looking for a way to blend ice skating with shopping? 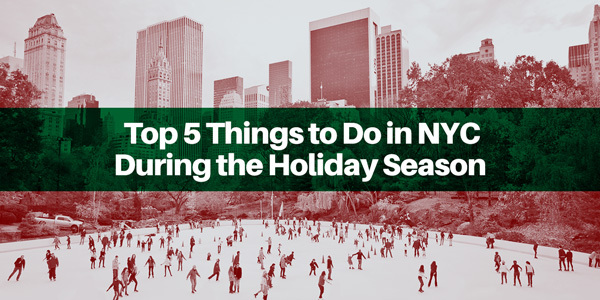 Look no further than Bryant Park on 42nd street, which houses both an ice rink and a bevy of merchandise tents ranging from hot chocolate to the latest fashion. Do some early Christmas shopping while supporting many of the city’s local retailers. If schnapps and reruns of A Christmas Story just aren’t cutting it, consider plotting your own 12 Pubs of Christmas with friends throughout the city. Team up and have a drink (alcoholic or soft) at 12 different bars and head home feeling like Randy Parker stuck in the snow. Wear a pink bunny suit for extra laughs from strangers. There’s nothing quite like staring at a display of some of the most festive decorations in the city. Well, the Sixth Avenue Decorations have you covered for all your ornamental needs. From captivating lights to thrilling motion picture displays on building facades, Avenue of the Americas will leave you with your mouth open wanting more.